We know that Kim isn't crazy about cooking (in spite of her beautiful kitchen)...I have lots of friends who feel that way. 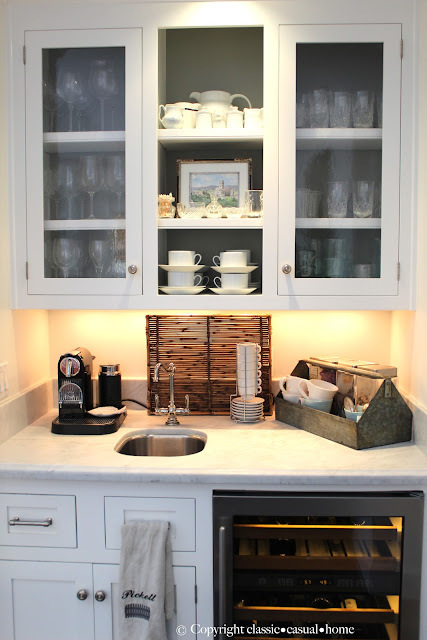 But, in Newport Beach, California,our kitchen is our family's favorite gathering place. 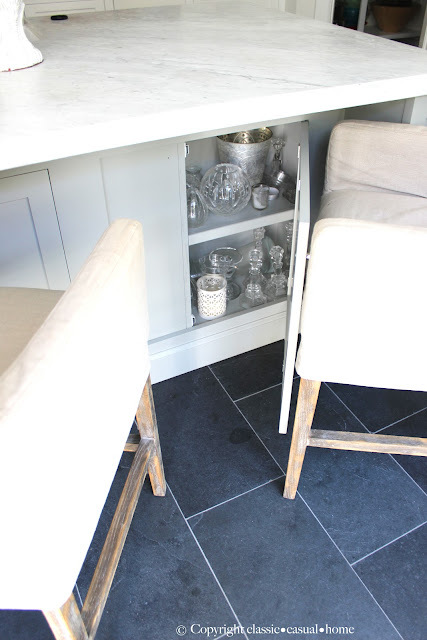 There is is a small sitting area in the back where I like to watch my husband cook (yes, I know I am lucky). 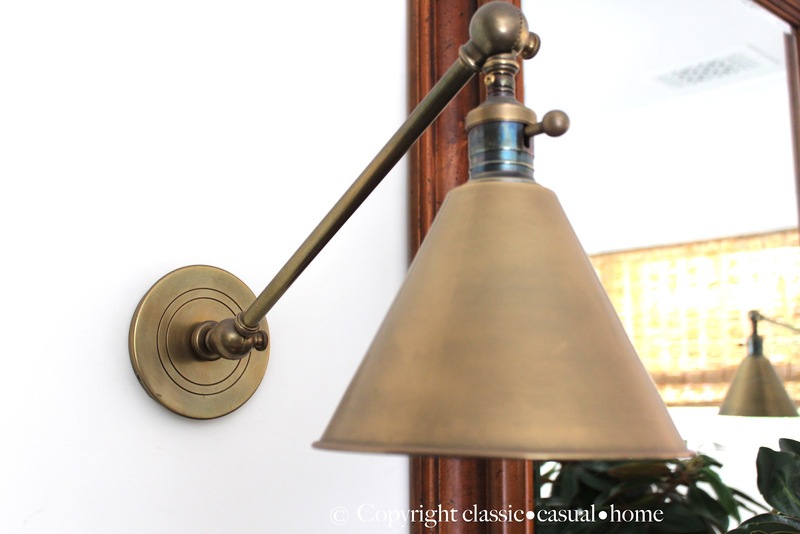 I also like to sit here and read my favorite blogs, like Savvy Southern Style, by the light from these Circa Lighting sconces. The gold tone ties in with the gold touches on the iron chandelier above the island. 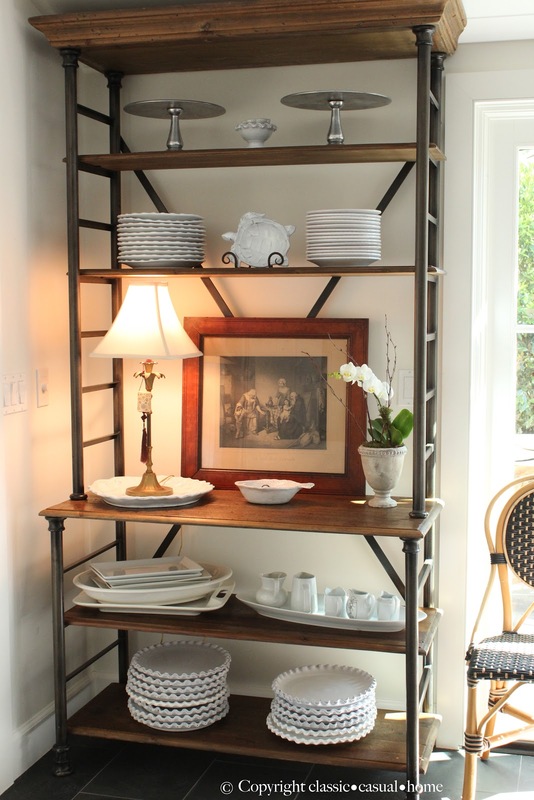 I placed baker's racks on either side of the French doors for easy to access dishes. 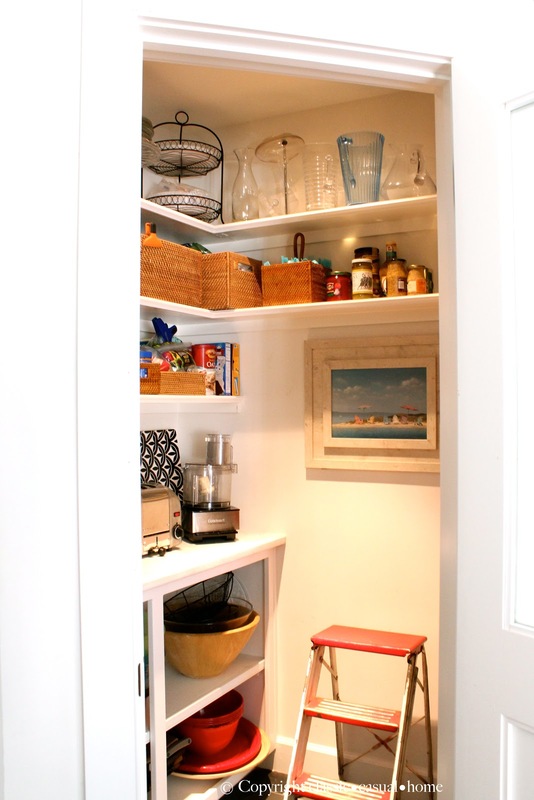 The walk-in pantry is great to hide clutter and appliances. I like the decorative element of these registers from Reggio Registers. 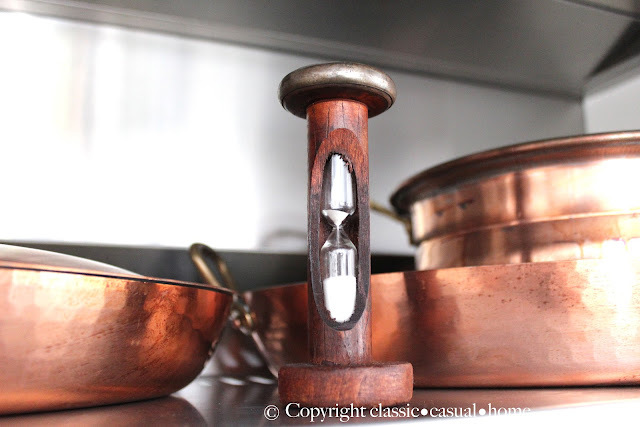 I also love this egg timer made from an antique thread spool and all our copper pans. 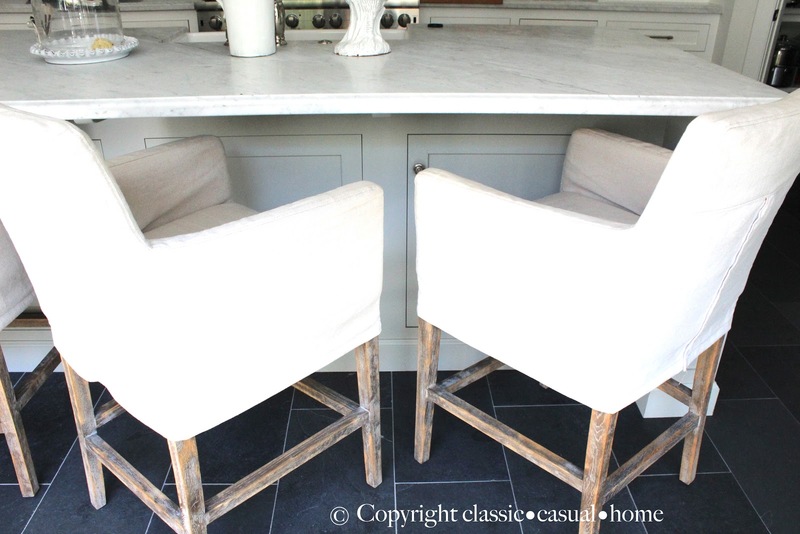 These slipcovered bar stools are especially comfortable. We made use of every inch of storage space in the island. The backs of the antique glass cabinets were painted the island color to add some contrast to our white dishes. 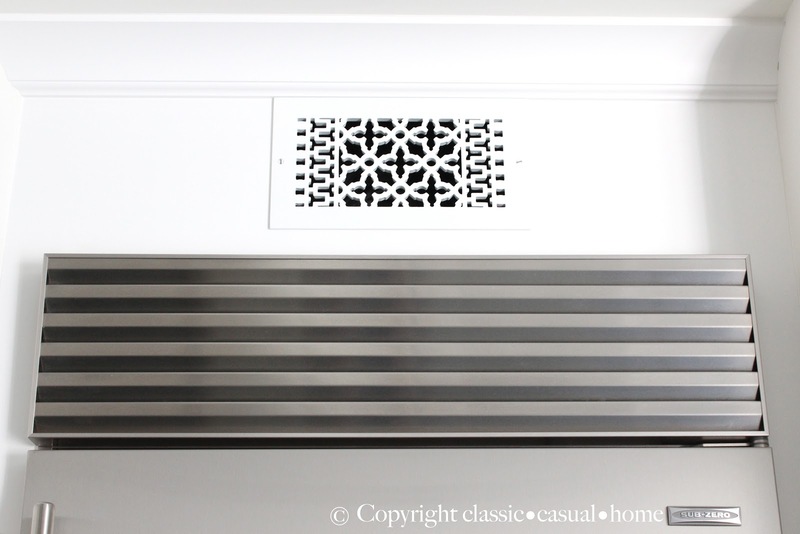 Fortunately, we also have some solid panel cabinetry to hide all the colorful wares. 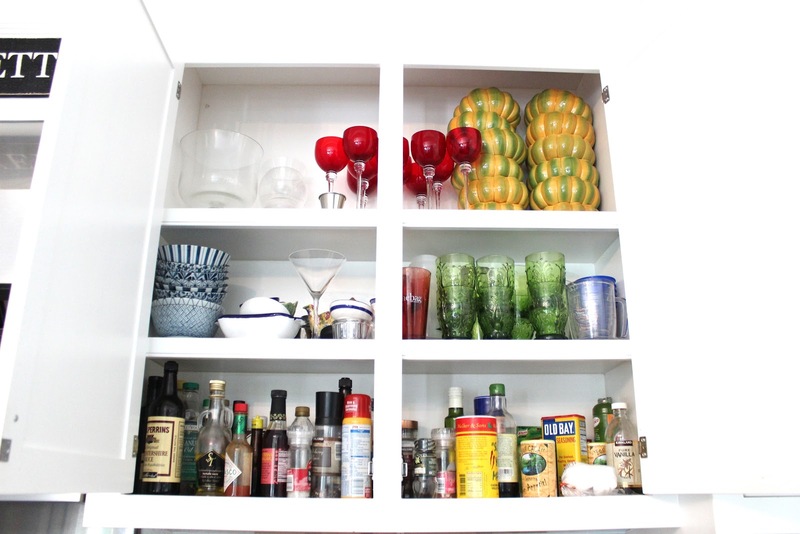 My favorite corner of the kitchen is the beverage center. 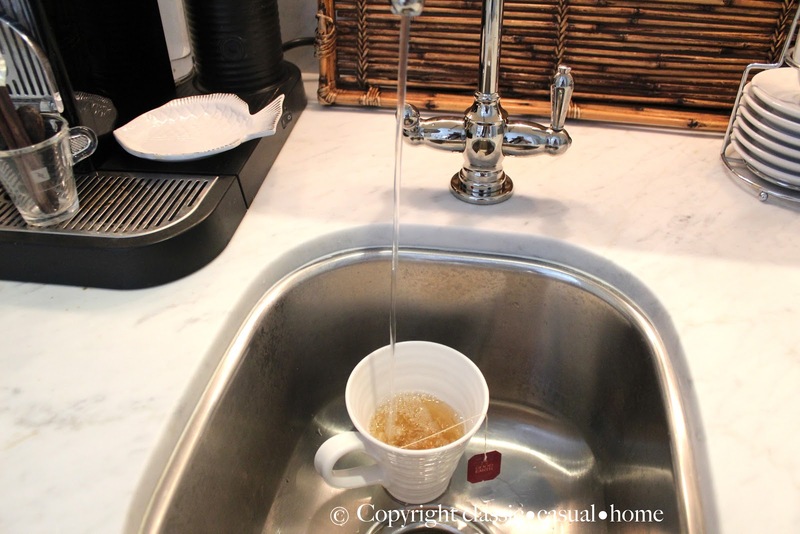 Where we have an insta-hot filtered tap for tea. 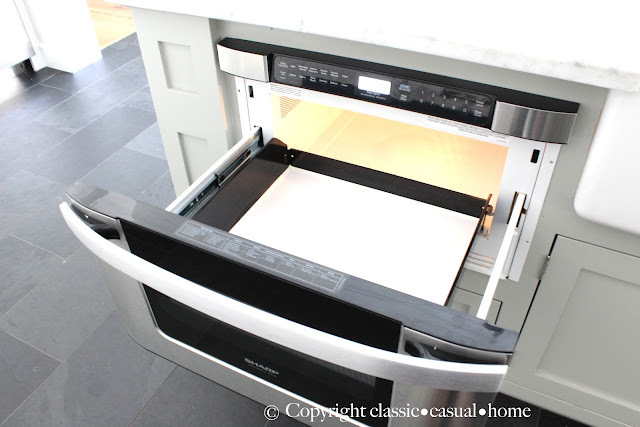 I am not crazy about the look of microwave ovens, so having ours under the island counter is handy but out of sight. Thanks so much, Kim, for letting me share my favorite space with all of your tasteful friends. Thanks so much, Mary Ann, for sharing your gorgeous kitchen. If I had this kitchen with the good stove believe me I would cook more. If you don't know Mary Ann or her lovely blog you are in for a treat. Go on over and look at all the magazine worthy rooms of her own and her friends that she shares. Better get comfy first. If you have missed any of the past guest posts be sure and check out my new page tab "guest series" and you can catch up on all of them. I am going to go spend the day with my mom and sister to celebrate my sister's birthday that was on Halloween. Just pinned the art in the pantry! What a great idea! 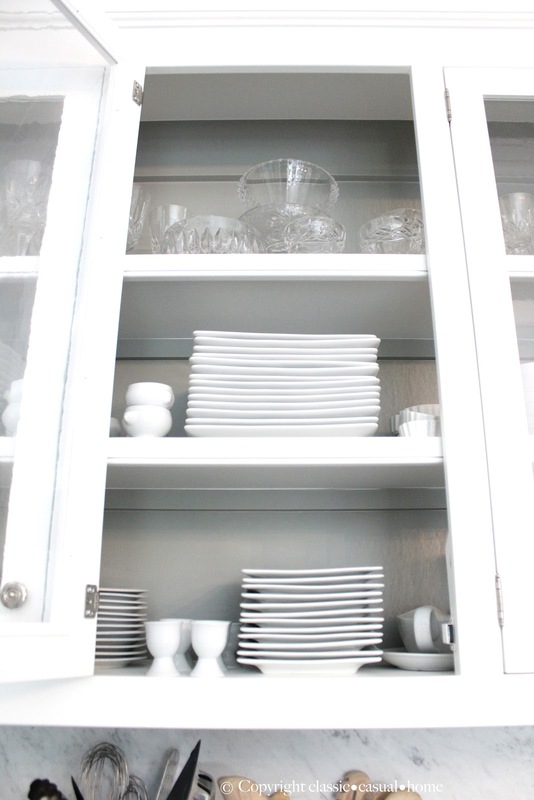 I love those bottom ruffle plates on the baker's rack - my family would have those broken in no time! 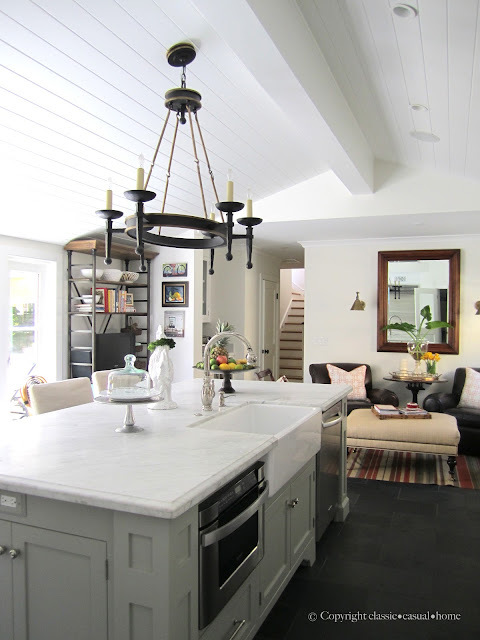 what a stunning kitchen area~! Wow! I truely love this kitchen!!! It is just beautiful and looks like it's right out of a magazine. I love the simplicity of everything, yet it's warm and inviting at the same time. I can tell that quality products were used in this kitchen too. Thanks so much for sharing. I'm off to check out her other rooms now. Whew...I think I would cook more too Kim. What a stunner! Gorgeous kitchen! Love the bakers racks on either side of the doors. What a gorgeous kitchen - I got a little inspiration here for my own pantry! 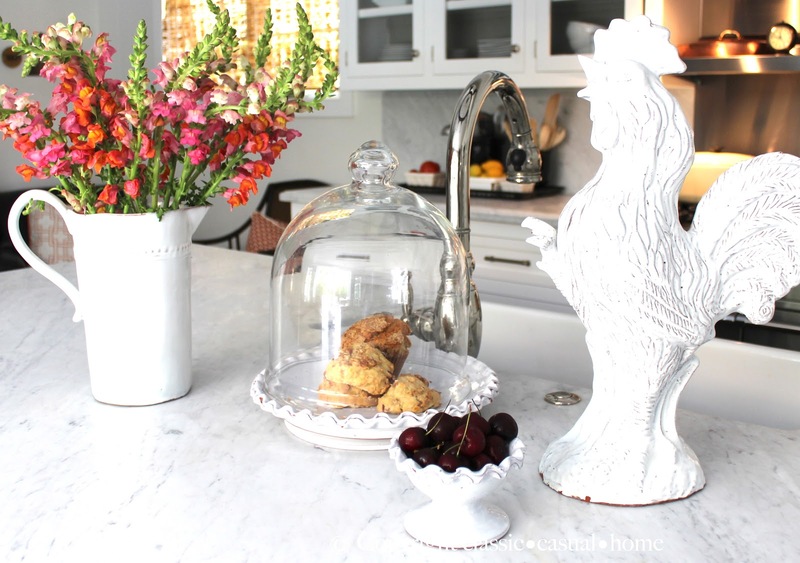 Beautiful guest post...Mary Ann has a lovely home for sure. Hello Marianne....love your kitchen and style! so nice to visit two of my favorite bloggers! Wow a very well thought out layout as well as being so gorgeous I always love the function/fashion part in a kitchen and you NAILED IT!!! What a beautiful feature! That kitchen is one of my top 5 I have ever seen! this is such a pretty kitchen. I wish I had instant hot water! Have fun with your mom and sis! I live in southern California, so nice to have such a stunning kitchen in our area! Thanks for sharing! gorgeous! I'll have to check out her blog. Kelly and I were saying how it was her 48th bday on oct 31 and my 38th bday on oct 30 =) Have fun on your girls day out! Thanks again, Kim, for having me over. Have a fun celebration! is that FANTASTIC!?!? i kept reading Mary Anne's blog about her small cottage, and it looks like she has EVERYTHING she needs there, despite the size. what a wonderful, utilitarian space! Kim thanks for having Mary Ann and her lovely kitchen...made my morning. Happy Friday all! Oh, this is new to me! I adore white kitchens and this in no exception. What a wonderful tour. Thanks so much for letting us peek at all the loveliness. I never get tired of seeing photos of Mary Ann's home and her kitchen is one of my fav's ever! She always does everything to perfection and now that she confessed that her husband cooks....well...I might just have to start hating her!!!!! Just kidding Mary Ann!!! Mary Ann's kitchen is gorgeous!! Love that beautiful chandy over the island! Gorgeous! I don't think I would ever leave the kitchen! Love the plank ceiling and the chandelier. Hope you have a great day! I absolutely love her gorgeous classic kitchen!!! Yay Mary Ann!!! I love Mary Ann's kitchen and blog! What fun to see her on here today. Kim - Thanks for sharing the tour of this beautiful kitchen. A beautiful room and a beautiful feature. Thank you for sharing! Such a nice kitchen and with a sitting area too! The lighting is wonderful, especially the iron chandelier over the island! Hope you have a wonderful visit with your sister...Happy Birthday to her!!! What a beautiful room/kitchen! I'm so enjoying these posts, I get to see beautiful rooms and find wonderful new blogs to visit...thanks Kim! Mary Ann's kitchen is fabulous! 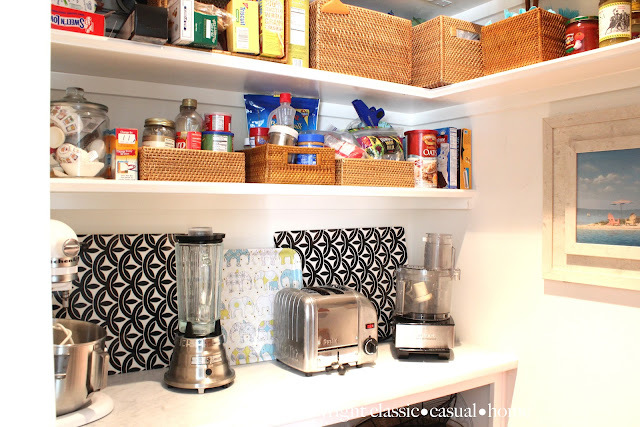 I think I'm a tad envious of her pantry but love her style! My heart skipped a beat!! !...Gorgeous kitchen....so many beautiful details. Mary Ann's kitchen is so wonderfully bright and crisp and yet so very cozy and warm in feel..perfection..!!! Mary Ann, I'm sure that magazines will be e-mailing you and calling you and begging you to let them come and take pictures for a magazine spread! This is just the most fabulous kitchen!!!! 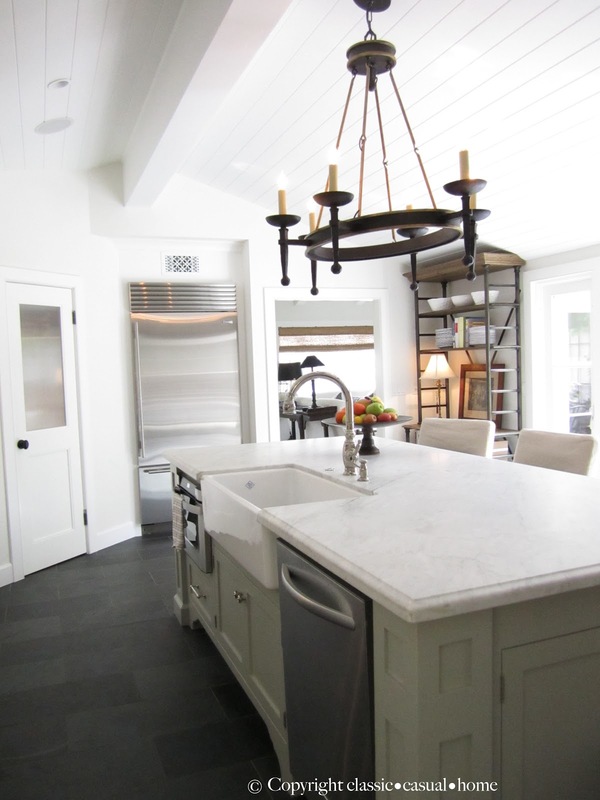 I love it's clean white lines and very chic feel... and that stove! Oh my!!!! I would never leave this kitchen!!!! No wonder you are a must read for me everyday!!! That's a beautiful kitchen for sure, I particularly like the bakers rack and the floor. But wait.... Kelly's bday was ON Halloween? Now that makes her 48th really really scary. What a beautiful kitchen!! Thank you for sharing it with us. Lovely kitchen Mary Ann :) Thanks for opening your home to us. I too like that beverage cornier! Great use of space! I adore Mary Ann's kitchen. I would die for a walk in pantry and love the idea of the micro where you don't have to look at it! I have loved Mary Ann's kitchen from the first time I laid eyes on it! I especially love the beverage center, mainly because I'm dreaming of one! Thanks for sharing such a beautiful kitchen. Kim, Mary Ann has the prettiest kitchen...and home! Love the bakers racks. I adore Mary Ann's kitchen and feel so lucky to have had the priveldge of having a latte in her kitchen while we talked shop...blogs actually. I love the lighting, the beverage center, the pair of chairs, the pantry...her entire house and charming courtyard is this amazing. It's warm and wonderful...just like Mary Ann! Your kitchen is so beautiful belongs on a magazine. If mine looked like that I might enjoy cooking more! What kind of floor is that? Some kind of slate? Love it! Gorgeous kitchen! Love the bakers racks and beverage center. Love the whole kitchen -it is beautiful.